So, you are new to chess, huh? If it hasn't happened already, at some point in the near future you might feel a lot like this guy. Once you know how the piece move, the rules of chess are actually fairly simple. However, don't be fooled. While you will learn how to play in just a few minutes, it can take a life time to master the game. 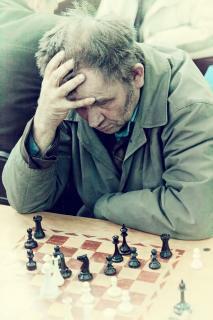 That is the great thing about chess - you never outgrow the game. In addition to having fun, there are many other benefits of playing chess, especially for kids. 4-time World Champ Susan Polgar said, "According to research, Test scores improved by 17.3% for students regularly engaged in chess classes, compared with only 4.6% for children participating in other forms of enriched activities." Develop analytical, synthetic and decision-making skills, which they can transfer to real life. Learn to engage in deep and thorough chess research which will help them build their confidence in their ability to do academic research. Help children gain insights into the nature of competition which will help them in any competitive endeavor. When youngsters play chess they must call upon higher-order thinking skills, analyze actions and consequences, and visualize future possibilities. In countries where chess is offered widely in schools, students exhibit excellence in the ability to recognize complex patterns and consequently excel in math and science. Learn more from Susan Polgar! Browse our great selection of Susan Polgar DVDs and learn chess strategies.